2013 is well underway down on the old farm. Or should I say new farm? 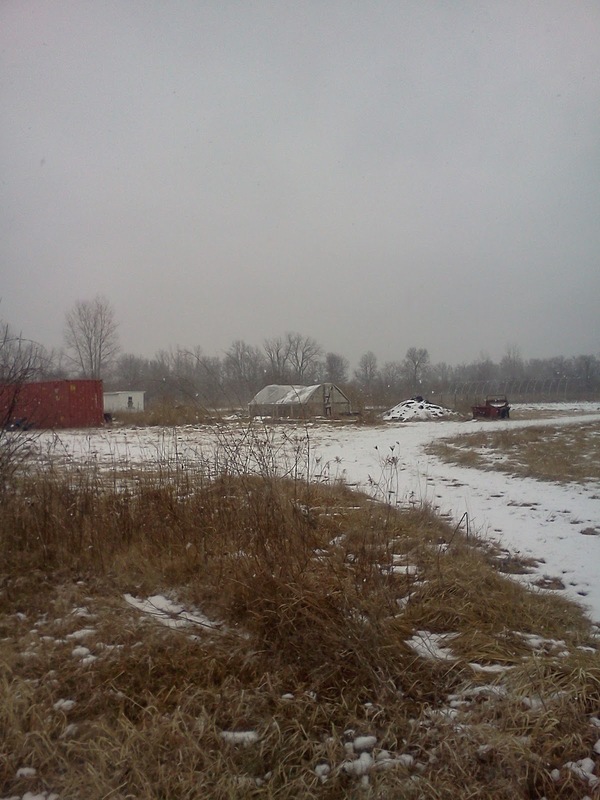 We are on new land this year, which was previously farmed by another small group of farmers. So, many things are different this year, including the plant starting situation. We inherited a small greenhouse on the new land, and we are using that to start all our transplants this year. We use some rudimentary heating in our greenhouse, and it's been a very cold March, so plants are off to a slow start. Onions are up. Chives are starting to come up. Tiny cabbage plants are just beginning to poke through the soil. While we anticipated a slower start his year, we are hoping for some consistent heat and sunshine soon to give the plants a boost. Aside from starting seeds, we are acclimating to our new spot in the northeast corner of Iroquois County in Illinois. The farm is surrounded by some beautiful land--land that all three of us native Illinoisans didn't even know about before we found the farm. Just across the street from the farm and just over the border in Indiana is Willow Slough, a fish and bird preserve with abundant wildlife and wetlands. And just down the road is Hooper Branch Savannah, one of the last sand savannahs in Illinois with 700-foot dunes and home to lots of native animals and plants. Needless to say, there is lots to explore out here, and we are looking forward to it if we get some downtime. We are on five acres in the middle of all this beautiful land. There's not much industrial corn in the immediate area. The soil is a nice, workable sandy loam (as opposed to the brick-like, heavy clay from last year) that we can't wait to get our hands into. By the time midsummer rolls around, we will have about half of the total land filled with all sorts of vegetables, herbs, fruits, and flowers, including native wildflowers. So, we have lots of space out here, and we encourage all of our CSA members to come out and see where their food is being raised and harvested. You can spend a part of a day pitching in on the farm with some weeding or harvesting, and another part exploring the bordering nature preserves, where you can even collect blueberries, raspberries, and blackberries when they are in season. Willow Slough offers camping, or you can pitch a tent on the farm if you want to make it a two day affair. We're excited to be starting season two at Three Plaid and proud to be back this year to offer one of the most diverse CSAs in the Chicago area. Check out our crop list for this year and let us know what you think.